It seems too good to be true, but chocolate milk could be just what your body needs after a strenuous workout. The 24-48 hours that follow exercise are the most crucial in repairing muscles to keep athletes performing their best. That’s why many of them are turning to chocolate milk as a quick and tasty resource for what the body really needs. It’s recommended that you drink a lowfat chocolate milk within 30 minutes of exercise for optimum benefits. Chocolate milk has the right blend of carbs and protein, a three to one ratio. There can be 8 grams of protein or more per serving. The water in chocolate milk rehydrates while the sugar replaces glycogens lost in exertion- sugar is not all bad! 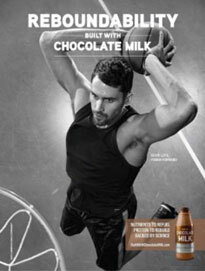 The chocolate milk rebound method has been sweeping through professional sports and endorsed by countless athletes like Kevin Love (pictured below) and Carmelo Anthony. The “Got (Chocolate) Milk, Refuel” campaign has featured athlete endorsements from every sport imaginable including speed skating Olympic Gold Medalist Apollo Ono, the USA swim team, professional triathlete Miranda Carfrae, NHL great Zach Parise, soccer star Kelly O’Hara and dozens more. There have been over 20 independent studies that support the benefits of recovery with high quality protein and nutrients in lowfat chocolate milk after a tough workout. Lowfat chocolate milk has calcium, vitamin D, phosphorus, protein and potassium that are all essential for strong bones. Not to mention it’s tastier than a banana! What else can chocolate milk do for an athlete? It has the right carb to protein ratio that is specifically shown to refuel exhausted muscles and help return to peak potential. The electrolytes rehydrate and B vitamins help convert food into energy. In a regular workout & recovery routine, lowfat chocolate milk has been shown to help athletes gain lean muscle & lose fat. 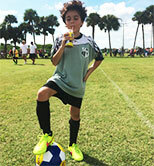 US youth soccer has partnered with NESQUIK® making chocolate milk their official “post game” drink. The AYSO has recognized the benefits and partnered with NESQUIK® as well. Through the partnership, NESQUIK® will support AYSO’s more than 500,000 youth soccer players and 125,000 registered volunteers through events, education and online at AYSO.org. Samples of NESQUIK® beverages will be available on-site at select events and tournaments.